First off, it is with regret that I was forced to disqualify many entries because of failure to comply with the rules. If you read the entry requirements, I was asking what brushes you presently needed and what you look for in a brush, not which set you want and why. Once the disqualified entries were taken out of the equation, I wrote down all names on recycled paper and drew them out of a hat as promised! 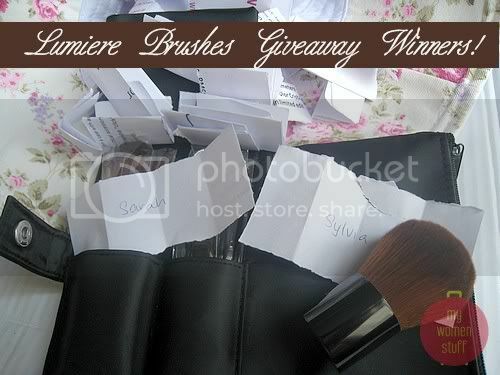 Here are the winners – Winners names are placed on/under the brushes you have won. I will be in contact through email and you’ll have 48 hours to respond or I’ll draw another winner from the hat. PREVIOUS POST: Can what you wear help your acne or help with anti-aging? sobs* not so lucky this time. wanted a kabuki so much! Thanks to Loving Minerals and ParisB! Very lovely surprise to be the lucky winner of the Kabuki Brush. And last week happened to be my birthday too. I will be waiting eagerly for the brush to arrive. congrats! u 2 are damned lucky!